Accessibility change between old and new timetables. Wu, Hao and Levinson, D. (2018) Effects of Timetable Change on Job Accessibility. Accessibility is often not a performance measure for transit services. 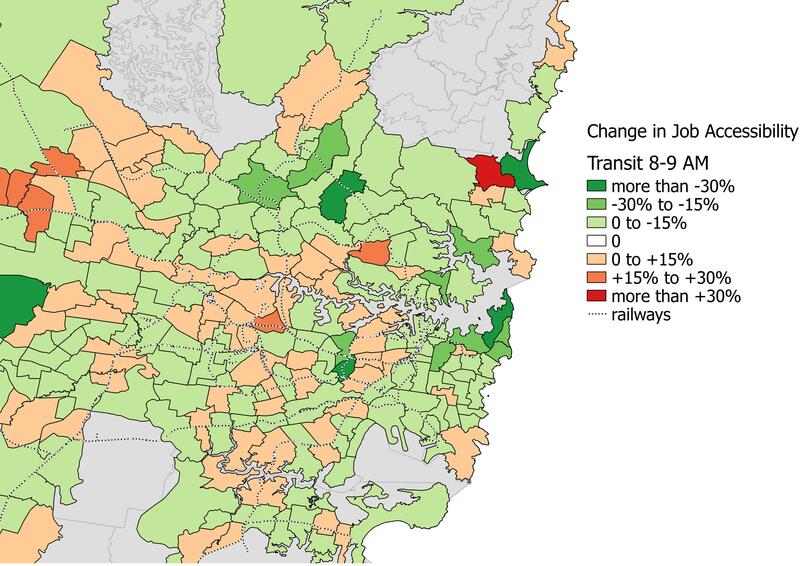 This study is conducted following the introduction of new timetables which intended to improve passenger throughput for Sydney’s transit services, but resulted in major delays experienced by passengers thereafter. Accessibility at 30-minute travel threshold before and after the timetable change are calculated between 8 to 9 am, to measure accessibility benefits, if any, from the new timetable. The results show a lack of systematic improvement by the new table, and downgrade of accessibility on average. The overall person-weighted accessibility dropped by 3%, from 45,070 to 43,730, and 63.3% of the population’s access to jobs would be adversely affected after its implementation. This study advocates for the inclusion of accessibility metrics into transit performance measures to connect with people who use transit.